Spearheading creation of Crisis Stabilization Center, county lawsuit vs. opioid manufacturers, getting bus service restored in Poughkeepsie, launching effort in Clinton/Milan/Pleasant Valley in 2013 to stop Central Hudson/National Grid drive to use eminent domain to take homeowners' private property (NYSPSC forced to back off and halt proceeding), getting monthly Co. Leg. meeting times changed from 4 pm to 7 pm, getting county historian restored to county budget, new Dutchess County small business registry, new county online budget survey, getting hybrids introduced into county vehicle fleet, stopping St. Lawrence Cement's pollution from coming anywhere near Dutchess, getting county to divest $100 million in official bank accounts from Bank of America and Wells Fargo, spearheading drive for Rhinebeck to join Greenway Compact (so then Joel could secure $285,000 in county funding for the Thompson-Mazzarella Park property-- 86 acres of the Rhineson tract).....yes believe it or not Joel really, truly, actually was integral to all of that happening-- all those things actually happened-- results-- achievements-- that's why Joel's been elected 8 times in a row to County Legislature. Joel successfully launched drive for Crisis Stabilization Center that has garnered County Executive Molinaro national media attentioon-- especially in Joel's strong November 2014 push for this during County Legislature Budget, Finance, and Personnel Committee meeting. Joel asked then-DCDMH Commissioner Margaret Hirst directly during the meeting if there was any funding allocated for this purpose in the proposed 2015 Dutchess County Budget; the response was no. Joel then circulated a letter for this in January 2015 at the first County Legislature meeting that year (this garnered significant support in the Democratic Caucus); even Poughkeepsie Journal reporter John Ferro recognized at Molinaro's February 2015 State of the County Address at CIA that this was a Tyner initiative (after Dutchess County Criminal Justice Council had recommended this in its 2012 Needs Assessment Report). Joel for decades now has released annual reports documenting massive corrupt pay-to-play conflicts of interest in our county government-- his last report this summer noted that literally $56 million of our county tax dollars has been allocated over the last six years to the same 23 companies who have given Molinaro and the Dutchess County Republican Committee over $150,000 (and 8 of those firms aren't even from Duchess County-- those 8 companies got $20 million worth of county contracts over the last 6 years and gave Molinaro/GOP $25,000). Joel launched effort for Dutchess County to sue opioid manufacturers by getting bipartisan support at Mar. 16th full-board County Legislature meeting this year on this (then June 7th front-page Poughkeepsie Journal article). Joel launched effort to restore $100,000 in funding for senior nutrition last December for the 2017 Dutchess County Budget-- through last seven years of advocacy to restore county funding for senior nutrition programs (and five-day week for county Office for the Aging Senior Friendship Centers). Joel launched effort for Dutchess County to have vehicle charging stations in 2009; finally this August it was announced our county will have four (still less than half of what Ulster County installed long ago). Joel launched effort for Dutchess County Legislature to pass sales tax exemption on residential installation of solar panels this August (something he had first introduced many years ago). Joel was the only elected official at massive rally of hundreds this summer to stop toxic/polluting/carcinogenic 650-megawatt frack-gas CPV plant in Wawayanda, Orange County from becoming operational-- and got four of his County Legislature colleagues (Francena Amparo, Hannah Black, Kari Rieser, and Craig Brendli) to sign his letter July 14th to stop both CPV and the 1100-megawatt frack-gas Cricket Valley power plant in Dover from firing up; the NYS Department of Conservation just decided to deny CPV the water permits it needed. 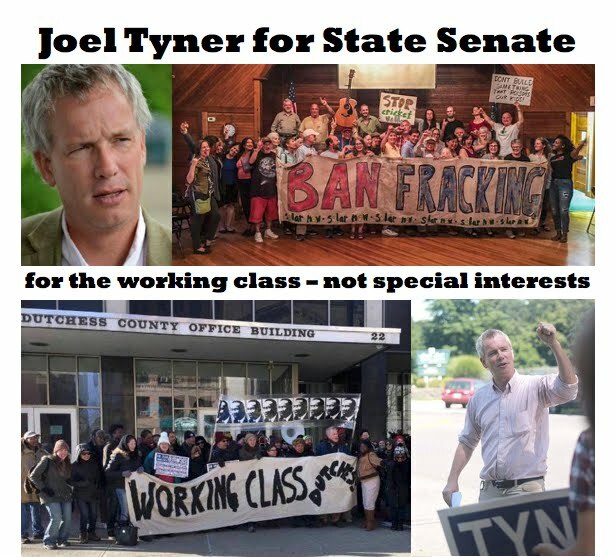 Joel for decades has also been right in the thick of the fight/efforts to successfully ban fracking, close Indian Point, get GMO foods properly labelled, get GE to dredge their PCB's out of our river, and stop St. Lawrence Cement's plans to expand their operations close to Dutchess County's borders by six million pounds more pollution for one new net job. Joel's strong advocacy for the law to be followed re: illegal county takeover of city bus system led to unanimous passage this July of a new Dutchess County Special Needs Transportation Task Force in our County Legislature. Joel's county budget amendments (stolen by Borchert/Miccio/GOP and not allowed to be re-introduced by Joel) passed last December 8th at a full-board meeting of our County Legislature-- to add $5000 more for our county's Human Rights Commission, $5000 more for a pesticide information effort, and $5000 more for a groundwater contamination public education campaign; Borcert blatantly lied in PoJo column. Joel originally proposed in 2006 that Dutchess County have a Small Business Registry to help make sure that as many local businesses here get county contracts (he was borrowing this idea from Rockland County)-- it literally took about a decade for Molinaro/GOP in charge of our county government to bring this to reality here for Dutchess (imagine how many jobs could have been created locally if it passed in 2006). Joel started hosting well-attended weekly public forums in Sept. 2013 towards the goal of stopping Central Hudson/National Grid/NYTO proposed/unneeded AC transmission/power line "upgrade" threatening to use eminent domain to take property from local landowers and destroy viewshed; the efforts Joel launched (he was the first one to hold public meetings on this issue) morphed into No Monster Power Lines and the Hudson Valley Smart Energy Coalitition-- convincing the NYS Public Service Commission to, for first time in history, reverse course and temporarily halt proceeding. Joel for the last few years now has organized (with Kathleen Everett) bimonthly Repair Cafes at the Rhinebeck Town Hall for folks here in northern Dutchess (and the Hudson Valley)-- where local residents can get fixed/mended for free clothing, lamps, vacuum cleaners, computers, furniture, bikes, electrical appliances, jewelry-- even welding-- his next one is Oct. 14th noon to 4 pm at Rhinebeck Town Hall at 80 East Market Street there. Joel helped expedite literally hundreds of thousands of county tax dollars to the Town of Rhinebeck in open space grant(s) for the Thompson-Mazzarella Park. Joel was told back in the summer of 2003 by Rhinebeck Democratic Committee Chair Warren Smith to turn his race against then-incumbent County Legislator Ed Haas into a referendum about the Greenway Compact-- because Haas at that point was leading the charge against the Greenway Compact and had unfortunately convinced the GOP then in control of the Rhinebeck Town Board to not join it-- even though many other Republican-controlled towns and villages across Dutchess County had joined the Greenway Compact. Joel knew then (County Executive Steinhaus had repeatedly and publicly made it clear) that the Town of Rhinebeck would not get one penny of any open space funding from "his" county Planning Department-- unless it joined the Greenway Compact. Joel saw that many in Rhinebeck at that point (in 2003) had given up hope of the Town ever joining the Greenway Compact-- it was left to Joel, frankly, to openly and publicly question, prod, push, and challenge then-Town Supervisor Dennis McGuire at Town Board meetings on issue of the Greenway Compact. Joel worked hard with the late great John Honey in the fall of 2003 to get the truth out about the Greenway Compact's benefits-- Haas sent last-minute mailing out all over Rhinebeck and Clinton bashing and lying about the Greenway Compact; John Honey supplied quote to Joel on this for his rebuttal mailing that year. Joel won election in Nov. 2003 over Ed Haas; even Daily Freeman noted Greenway Compact issue. Joel several years ago moved to amend the county budget to add Town of Clinton to service area for our county's Office for the Aging for home-delivered meals; because of that, Clinton was added to service area. Joel's resolution for solar panels on Dutchess County buildings passed unanimously at the Apr. 2013 full board meeting of our County Legislature. Joel's resolution for a Solarize discount program for local homeowners passed unanimously in June 2013 (similar to what was already in place in Madison County). Joel began pushing in 2004 for a county historian to be appointed; finally this happened in 2006. Joel began advocating for an interactive online county budget survey in 2009; three years later in 2012 Dutchess County actually began doing this. Joel pushed for several years for this-- then successfully convinced the Dutchess County Association of Supervisors and Mayors to unanimously pass a resolution in December 2011 at their monthly meeting at Copperfield's in Millbrook in support of Joel's idea for Dutchess County to save millions annually for local towns, cities, and villages with an optional county municipal health insurance consortium as in Tompkins County. Joel convinced our county's then-Planning Commissioner Roger Akeley in 2009 to support concept of Independent Dutchess Energy Alliance-- to create green jobs with energy-efficiency retrofits and literally save a billion dollars on electric bills for county residents in next 10 years; Joel's resolution to create an Independent Dutchess Energy Alliance passed. Joel successfully led effort in December 2004 to end waiting list for senior home care in the county. Joel led effort (with Carola Madrid) in 2004 to make sure homeless veterans no longer turned away from shelter in county (in December that year County Executive Steinhaus ended up announcing $100,000 extra in funding for Hudson River Housing earmarked for cause of expanding overnight homeless shelter beds from 12 to 60). Joel led effort in 2008 to restore $1.5 million in cuts proposed by the County Executive to the Astor Home for Children for zero-to-five early childhood programming, Grace Smith House, Family Services, Cornell Cooperative Extension, Dutchess County Community Action Agency, Dutchess County Arts Council-- and stopped County Exec's proposal to eliminate our county's Human Rights Commission-- while cutting County Exec's proposed 2009 budget by $5 million-- holding RRA accountable as well. Joel convinced our county's Department of Health in 2004 to stop forcing our frail elderly addicted to smoking for decades to smoke outside in inclement weather at Ferncliff Nursing Home. -- for Independent Dutchess Energy Alliance: $1 billion in savings on electric bills over ten years, based on successful green jobs/retrofits example of Cambridge, MA. -- for Dutchess to save literally hundreds of thousands of dollars annually on power costs w/Municipal Electricity Gas Alliance (like Putnam, Ulster, Sullivan, and twenty other counties). -- for saving 30% on lighting bills in county bldg. 's switching fixtures from T-12's to T-8's/metal halides. -- for Dutchess to keep using lever voting machines and state/federal gov. 't to make sure we can too. -- for zero-waste approach to resource recovery in our county: save money, create clean green jobs. composting toilets to be on county property. St./Poughkeepsie (then all county buildings). -- for new SuperLOOPer discount card at local stores and restaurants for frequent users of LOOP bus. crisis (as in Ulster, Orange co.'s). -- for Dutchess ESAN "Recommendations forStream/Flood Management in Dutchess" to be followed. markets/green resources (as in Westchester). -- for bike rental program in Dutchess at no cost to taxpayers (as is already in Washington, D.C.). -- for Dutchess County to be part of Hudson Valley Community Preservation Act to save open space. -- for cost-saving "Green House Project" nursing home in county-- proven to make seniors happier. -- for particulate matter air pollution to be measured in Dutchess County as it was until 2002. -- for greatly expanding current circuitbreaker for school property taxes (bipartisan Little/Galef bill). -- for real relief for Dutchess Co. property taxpayers-- Omnibus Property Tax Relief and Reform Act. -- for ending secret market manipulations on Wall Street causing higher gas/home heating oil prices. -- for wetlands (even small ones) in county to be saved from being paved over by developers. -- for Cary Institute of Ecosystem Studies recommend. 's air pollution/quality standards to be followed.